DURMN1500BKD Features: -Get long-lasting, reliable power for the devices your business uses most. 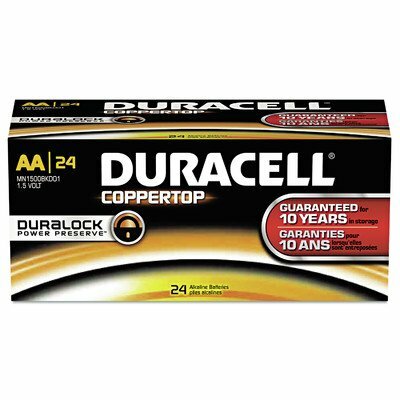 -CopperTop® batteries are engineered to deliver just the right level of power for most electronic needs. -CopperTop® batteries contain no added mercury and are rated for reliable operation in extremes from -4°F to 129°F. -Individually date-coded and up to 10-year freshness guarantee in storage. -Battery size: AA. -Duralock power preserve technology. Size: -AA/1.5 Volt. Pack Size: -24 Per Pack. Product Type: -Alkaline/Lithium. Country of Manufacture: -United States. Dimensions: Thickness: -7.88 Millimeters. Overall Height - Top to Bottom: -5.13". Overall Width - Side to Side: -4.63 Millimeters. Overall Product Weight: -8.55 lbs.